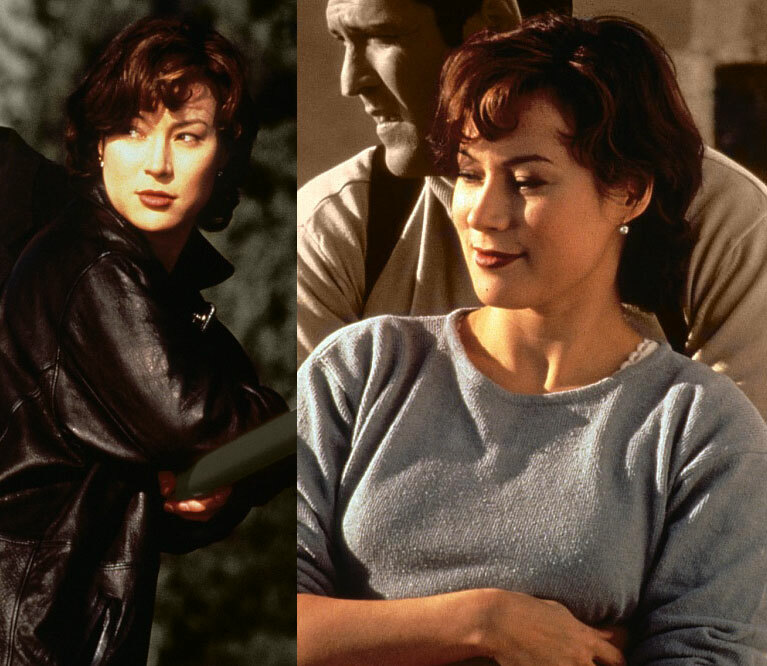 The premise of Man with a Gun (1995) is utterly ridiculous, but it does pay some undeniable dividends for Jennifer Tilly and her fans. To shorthand it: A powerful mobster (Gary Busey) assigns his bestest hit-man (Michael Madsen) to eliminate his scheming wife (Tilly), little suspecting that the hitman and wife are already knocking boots together. Rather conveniently, the imperilled wife just-so-happens to have an identical twin sister (Tilly too! ), who the hit-man can theoretically kill in her stead, leaving the two of them free to abscond with their ill-gotten gains. Of course, it doesn’t work out that way, because the big lug goes and falls in “love” with the sister, who’s as sweet and sincere as her sibling is sultry and sly*, leading to all sorts of bloody complications and double-crosses. None of it makes a jot of sense, and the paper-thin characters never really behave like living-breathing human beings… but it’s still a lot of fun to see Tilly tackling two starkly contrasting roles, and playing them both to the hilt. In a way, it’s a shame that the big fancy awards tend to go to actors who give great performances in well-written and well-directed films, rather than to actors who manage to rise above the crappy material they’re lumbered with, using their natural talent and charisma to ensure that the audience remains engaged in their scenes, regardless of all the dreary tosh that happens in-between his/her oasis-like appearances on-screen. If they gave out Oscars for good acting in bad movies, Tilly would have a shed full of them by now! * Seriously, anyone writing an essay on the “virgin/whore” dichotomy in genre fiction should definitely check this flick out! This entry was posted in Rants about Films and tagged Jennifer Tilly, Man with a Gun. Bookmark the permalink.